You work hard to get email subscribers. You created one awesome freebie. Paid a designer to make it look pretty. And hired a copywriter to write a persuasive opt-in page. So now that they’ve subscribed to you… why won’t they read your email? Why are your email open rates in the single digits? And tanking? First, you need your users to become familiar with your brand. The more users become familiar with your brand, the more likely they are to read your emails. FulcrumTech did an interesting study on email frequency. 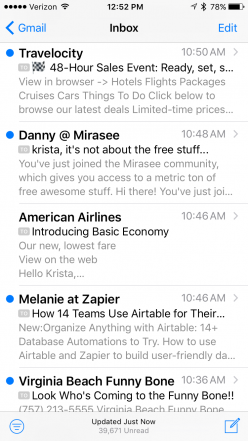 They sent the same email to their list for five days straight and got amazing results. The results of the test found that opens increased by 103% and paid subscription sales increased by 269% (Editor’s note: Your results may vary. Test to know for sure how your subscribers will respond to receiving either more or fewer emails from you). It’s not that simple. Ask any email marketer and they’ll tell you that getting your message delivered to the inbox can be challenging. These tips can help. Your sender score is your sending reputation. It is a score that is tied to the IP address that you send your email campaigns from. 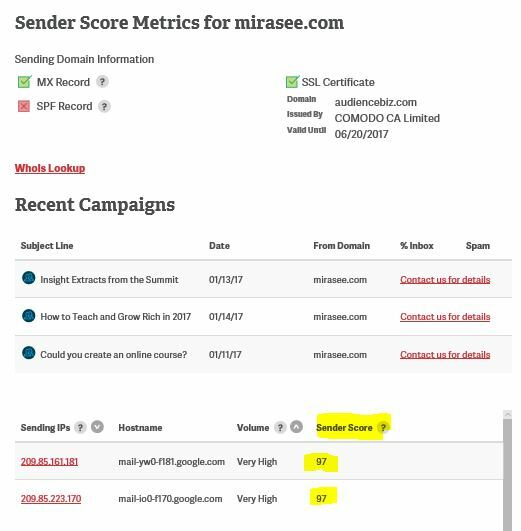 You can check your Sender Score on Senderscore.org. Think of your sender score like a credit score. Similar to how you qualify for a loan based on your credit score, the ISPs determine if you are worthy of delivering to their users by looking at your Sender Score. If your score is low they might automatically send your email campaign to the spam folder or block your messages from completely being delivered. Your scores might be low if you have poor open and click rates. This is why list quality is always better than list quantity. 2. Plugin your domain name or mailing IP. 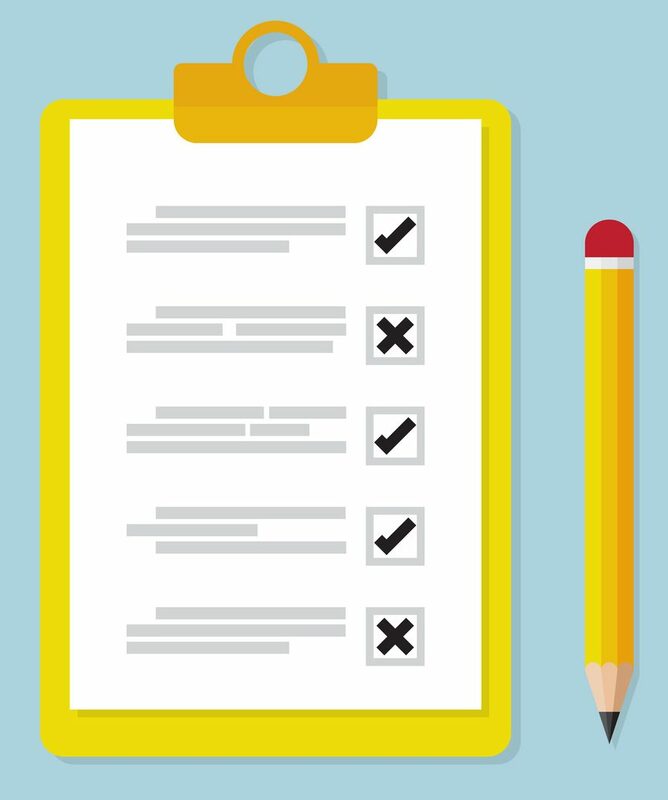 Review your report and see your score at the bottom. Another common problem that prevents your emails from being successfully delivered is when your emailing IP address is on one or more blacklists. While getting blacklisted also reduces your Sender Score, you need to be able to identify which blacklist you are on, so you can take the steps to get removed. Solutions like MXToolbox can run checks multiple times per day and send you alerts if your IP or domain name gets listed on a blacklist. BONUS: Click Here To Get 10 Email Newsletter Ideas! We just spoke about your Sender Score and how if that score is low, it could send your campaign into the pam folder, but there are several other reasons as well. In fact, Mailchimp has an entire guide on avoiding spam filters. The first and MOST important thing you can do is to make sure your email campaign is in compliance with CAN-SPAM laws. This means your email must contain the from-name, reply-to address, and subject lines. You have to provide a physical mailing address and a clear unsubscribe link. This gives the appearance that you have a developed relationship with that user. Another option is to personalize the email subject line with the recipient’s first name. Take a look at this example of my inbox. Not all senders use the first name in the subject line, and when you do, the reader is more likely to notice your email. Having a quality email template that is properly coded can also help you improve your delivery performance. Sloppy code with unclosed tags is a red flag and can instantly get you filtered into the spam folder. If you are not sure, run your HTML through this cool tool called EmailLint. There is also a list of spam-like words to avoid when creating your email copy. For example, some keywords to leave out of your content are “free sample,” “free money,” “order today,” and “get paid.” You want your email body to sound like a friend writing you an email. If you must use the word “FREE,” you can do so as long as it’s in the proper context. Subject lines such as “A List Of Sugar-Free Foods For Diabetics” vs. “Claim your Free Gift” both have the word “Free” in there, but the context is different. Timing is everything, and you want your email to be in the right place at the right time. Trying to catch your subscribers while they are in their inbox can be a challenge. However, many email sending platforms are becoming intuitive and offering features that allow you to deliver your message when each subscriber usually checks their email. 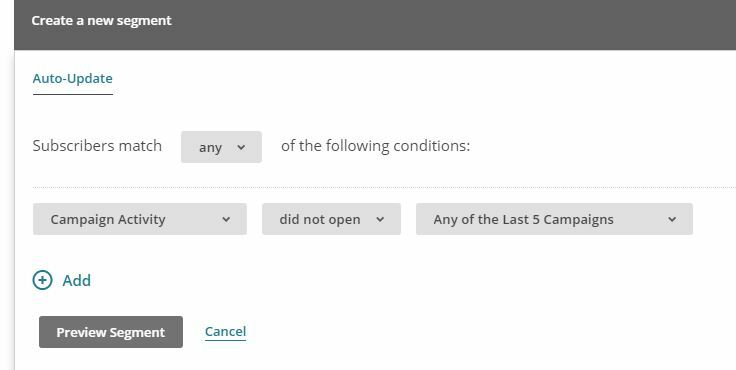 For example, MailChimp offers a feature called Time Warp that allows your email to deliver based on the recipient’s time zone. 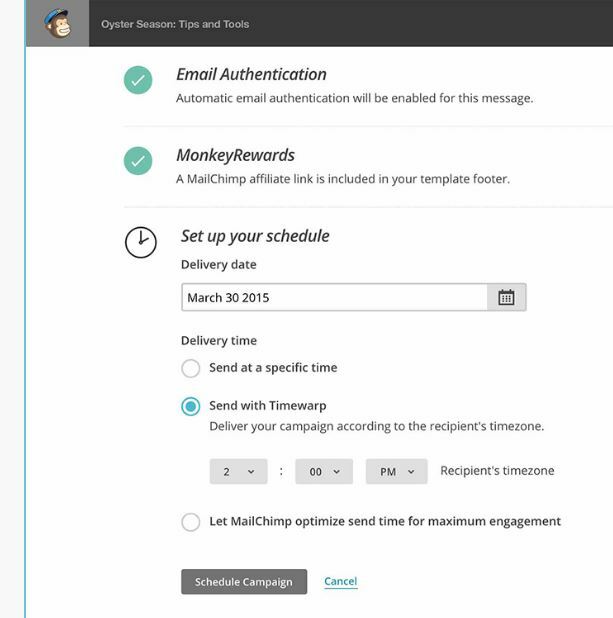 Mailchimp has another paid feature called Time Optimization. They are able to get behavioral information from previous emails you sent or ones that other mailers have sent to a specific email account, to identify if they are checking mails more often in the morning, afternoon, or evening and try to push your message out around the time that could potentially work best for that recipient. Look at the features of your email service provider, to see how you can optimize the timing of your emails. Do not keep someone on your list who is not interacting with your brand. If you want to see a higher percentage of open rates and clicks then you should purge your list of unengaged subscribers. What’s the recommended guideline for removing inactive users? It’s a safe bet to remove anyone from your list who has not opened any of your emails in the last 3 months. Also keep in mind, if you are mailing to someone who is not interested in the content you are sending it is likely they will move you over to the spam folder. In this example, we are using MailChimp but most email sending platforms will let you perform a similar procedure. Locate the list of subscribers that you want to find inactives on. Select Segments from the drop-down and then click Create A Segment. You can work on improving your sender score by eliminating these inactive accounts from your list. 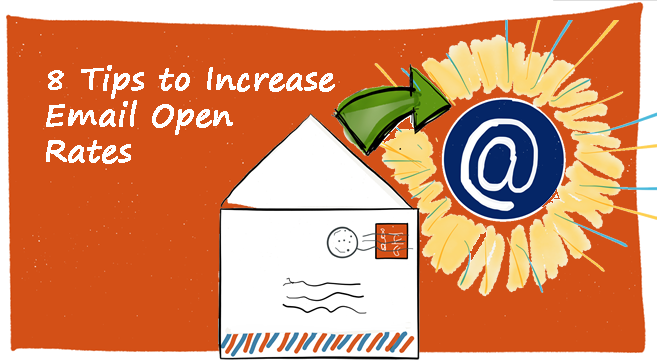 The next time you send off your email campaign you will see a big difference in your open rate percentage. Don’t simply send email for the sake of sending emails. Knowing more about your audience will help you send carefully crafted emails to the right recipients which will result in a better engagement rate. Even simple things like segmenting by birthday month, gender, or age can make your email stand out in a crowded inbox. You can also segment your list according to their interests. For example, if you’re in the marketing space, have segments for content marketing, live events, and direct mail. MailChimp did a study which found that open rates of segmented mailings were 14.52% higher and unsubscribes were 10.07% lower than unsegmented mailings. Clearly, segmentation is a powerful tool. In our last tip, we talked about removing unengaged subscribers, but another recommendation that you could do is use segmentation to identify inactive members and warn them about being removed from the list and to take action, by clicking a button in the email campaign so that they don’t get purged. Maybe you can save a few sinkers this way! You want to have subject lines that grab attention and compel your subscribers to read the email. Subject lines that are relevant to the recipient and subject lines with swag. Keep your email subject lines fun and funky with humorous hints such as “Wine or Whine, the choice is yours.” Or “Is that a sale in your inbox, or are you just happy to see me.” Quirky email subject lines keep things interesting and promote better rates of engagement. If the subject line makes them laugh, they will be sure to read. Check out some more humor related subject lines here. At the end of the day, you want to provide value to your user. If you are sending them slapped together content subscribers are going to ignore your emails or move you into the junk folder. They joined your email list for a reason. Treat your subscribers like gold, and provide them with things your average website visitor wouldn’t get: special discounts, coupon codes, a free downloadable. Give them a reason to make your email a priority. If you are having trouble coming up with content ideas, send content around upcoming holidays or create some kind of a theme. Another good idea is sending your subscribers some “behind the scenes” stuff that you might be releasing in the near future but have not yet been published on your website. Treat your subscribers well, and they will do the same for you. Users are spending more time on social media than they are in their inbox, so making sure that you provide them with a way they can connect with you on social media in all of your emails is a great way to give them an option to follow you on social media. You should also make mentions on social media when you send out an email and make it compelling. Jump over on Twitter and send out something like, “We just sent out an email with a discount code to get 30% off.” This will make new users want to sign up for your email list. This article talks about how you can turn your existing customers into brand ambassadors. It says customers are more likely to mention your brand if you give away freebies, or have stellar customer service. Like any good marketer, you must test your inbox placement. Always have a few different email addresses of each major email domain (Yahoo!, Gmail, Hotmail, AOL, etc.) 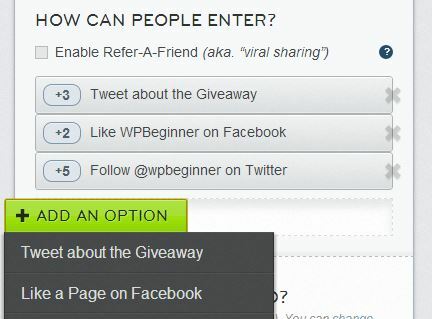 in your subscriber list that you can test on a regular basis. This way you know exactly where your mail is landing. Keep in mind, just because your emails are successfully delivered in Yahoo! doesn’t mean they’re delivered in Gmail. So, it is highly important that you test each major mail client. Choose one of the above recommendations and focus on one at a time. Trying to do all of them at one time might overwhelm you and create more complications. When you focus on one task at a time you can really learn how to make it the most effective for your business. Which of these tips will you put into play? What else have you tried before? What worked? What didn’t work? Thanks for such a thorough guide! It sounds like you have covered everything! Two questions: 1) We use Mailchimp and have thought about segmentation but haven’t done it because we only have 700 or so subscribers and MC suggests we have a lot more for effective segmentation. Plus, we only collect their first name and email address so I don’t know how we would know how to segment them. 2) We have a podcast (it’s called Style Matters about creating a home you love) and we’re always struggling to come up with really helpful content for the newsletter, other than just a list of that month’s episodes and the guests we had on. Should the newsletter be something other than a summary of what’s on the podcast? This article increased my knowledge of email lists and how to use them. The timing of emails in particular was something I did not know, although I have seen it used with me, for example when certain emails from certain lists pop up exactly as I am online reading email. I plan to use all or many of these ideas in the near future. Open rates are a key way to measure subscriber engagement. A well-crafted subject line is the best way to ensure your message gets across. If you want to maximize the reach of your email marketing campaigns, you’ll need to do everything possible in order to avoid being flagged as spam. Eventually, thanks for sharing these potential tips regarding this subject.